On The Corn Snake.co.uk you can find information on keeping Corn Snakes. The Corn Snake.co.uk is a website built with Corn Snake keepers in mind, with the aim of helping both Corn Snake enthusiasts and beginners who are thinking about keeping a Corn Snake as a pet. We have an extensive care sheet, which is divided into clearly defined sections, so that the information you are looking for is easy to find. 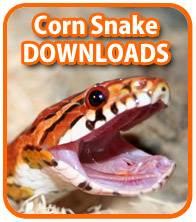 We also have a photos page, with many Corn Snake photographs for you to enjoy and appreciate. The Corn Snake Forum is a place where you can chat about and discuss your Corn Snake with other Forum members. It's a good place to look for help if you have any questions regarding your snake and it's general care. We have many regular members who will eagerly offer advice and you can also post photos, links and more. If you would like to send your Corn Snake Photos to add to the Corn Snake Photos page please email your best pictures to photos@thecornsnake.co.uk along with your name and your snakes name. THE CORN SNAKE.co.uk is a non-profit website which has no annoying popup's. TheCornSnake.co.uk is part of TheReptilian.co.uk group, a network of reptile and amphibian related websites giving care information on a host of exotic pets. Corn Snakes are a small sized colubrid snake native to Central and the South-East of North America. They have been popular in the pet trade for many years and are a great beginner's snake for those new to snake keeping. Corn Snakes come in a variety of colours and patterns (morphs) and are a very attractive and docile species of snake. Temperament: Corn Snakes have great temperaments as they are docile and easy to tame. They are inquisitive and quite active, so are great to watch when they explore their surroundings. Corn Snakes rarely bite, so are safe around children if supervised appropriately. Attractiveness: Corn Snakes come in a variety of colours and patterns, called Morphs, so you will always be able to find a Corn Snake that appeals to you. All the morphs have similar care needs, so choosing a Corn Snake for your preference of morph is a good way for deciding on which Corn Snake is right for you. It is a good idea to research all the different varieties of Corn Snake before making the decision on which morph you would like to own. Ease of Care: Corn Snakes are very simple to take care of and it does not take much time to fulfil their every need. They only require feeding every 5-14 days depending on the age of your Corn Snake and, with regular spot cleaning, will only need it's vivarium cleaned out once a month. Daily water changes are necessary, but apart from this they require little attention, except for when handling. Interest: Corn Snakes are a very interesting pet, as they are not your typical domesticated animal. They are good to watch and you may be easily intrigued by your snake's movements, habits and behaviour. You are likely to find that watching your Corn Snake constrict and eat it's prey, climb upon branches and go through the shedding process are quite fascinating. Size: Corn Snakes are popular because they grow to a manageable size. The average size for an adult Corn Snake is around 4-5 foot, so your Corn Snake will never grow too large to handle. Cost: Depending on the morph you choose, Corn Snakes are a relatively cheap snake to buy and they are not expensive to feed, but they do require a basic set up made to their requirements. Every Corn Snake will require a suitably sized vivarium, a heat source, a thermostat, a water bowl, 2 hides, artificial plants and some substrate, so the initial set up may be expensive, but once this is established then maintenance costs are minimal. Hardiness: Corn Snakes are quite a hardy species of snake and are unlikely to get ill with appropriate care. They are also appreciated for their trouble free feeding and shedding processes. Many pet snakes do not feed or shed well in captivity, but Corn Snakes rarely have a problem with either of these two things. Longevity: Many snake keepers like snakes because they are long lived. Corn Snakes can live up to about 15 to 20 years with appropriate care, meaning that your pet will be with you for a long time, giving you many years of enjoyment and interest. Companionship: Although Corn Snakes seem to appreciate regular handling and contact with their owners, they are not as receptive to humans as other animals that are commonly kept as pets. They can not be taught to respond to their names or do tricks like a dog, nor will they appreciate fancy toys like a cat or lots of affection like a rabbit. You should only choose to keep a Corn Snake if you understand that they are not entirely domesticated and may not always appreciate your attention. Food: Corn Snakes have a diet entirely made up of rodents, which provide all their nutritional needs. Some people in your household may not be too happy with the prospect of having frozen mice and rats in the house, let alone the thought of them being in the freezer with the family food. Make sure that every one is comfortable with you having frozen prey items in the house, before you buy a Corn Snake. You should also research the availability of your Corn Snake's food before buying you snake. Frozen rodents are usually readily available from Reptile Shops and online, but it is advised that you check availability in your area as it may prove difficult to feed your Corn Snake if there are no stockists nearby. Longevity: Corn Snakes can live up to 20 years with appropriate care, so may outlive their interest, especially when bought as a family pet. Before you buy your Corn Snake ensure that you are willing to make such a commitment as it may be difficult for you to rehome your Corn Snake when your situation or life style changes. Phobias: Many people are afraid of snakes and even though Corn Snakes are totally harmless to humans, this will include your pet snake too. Be prepared for negative comments about your pet and do not be surprised if some people do not share your enthusiasm for your Corn Snake. Still interested in keeping Corn Snakes? 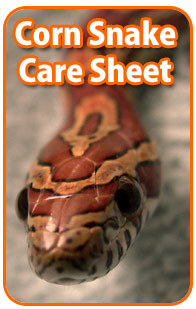 Then please visit the Care Sheet page for more information about Corn Snakes and their general care.